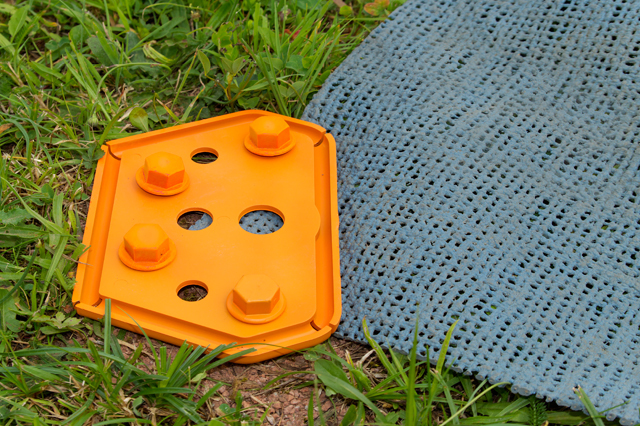 The orange Uniplate has been designed for eliminating tripping hazards of tent carpets, mats and sheets which can be fixed without damage. To fix a tent carpet securely to soft ground the Uniplate may be used separately or be combined with two plates similar to a sandwich construction. In combination with the blue Anchor Plate 1.0 and the enclosed u-shaped steel hook a safe basis for storm straps is created. By occurring stronger wind you easily can add storm straps to double secure your awning with our Peggy Pegs. For awning-owners we have created a set which offers all components for the fixing to almost every ground. If storm straps are needed the set may be complemented by some Tie Straps. what are you searching ?